Healthcare services are in high demand at all times. And today health has even turned into a real trend which leads to the medical area becoming highly competitive. That's why every clinic willing to succeed should go with the tides and fully meet the latest clients’ expectations. This implies, among other things, mastering of innovative mobile technology. Yes, all modern hospitals and medical companies need their health apps. And if you're not among pacesetters, it's high time you ordered hospital mobile app development. In our article, we’ll do our best to ground the view more firmly. You’ll learn the main details on the issue, including the latest mobility trends in the healthcare industry and main medical apps benefits. So, why should your clinic have its own custom hospital app? We’ll give at least 10 reasons explaining such a need. A hospital app helps reduce the costs of retaining clients and positively affects customer loyalty. Undoubtedly, people are going to choose those clinics where they can get all the necessary information, make an appointment at the doctor or see the tests results anywhere and anytime. Medical apps being integrated with a centralized database allow doctors to take a look at the patient's electronic medical record, see the results of the tests and make a new record in a very easy and comfortable way. With all this information at hand, a physician is able to have more patients at the same time giving each of them more attention, and therefore, to improve the quality of services. Mobile apps may become an effective marketing tool. Use the push-notification system to inform users about news, promotions, special offers. This is the best way to turn a one-time customer into a loyal one. 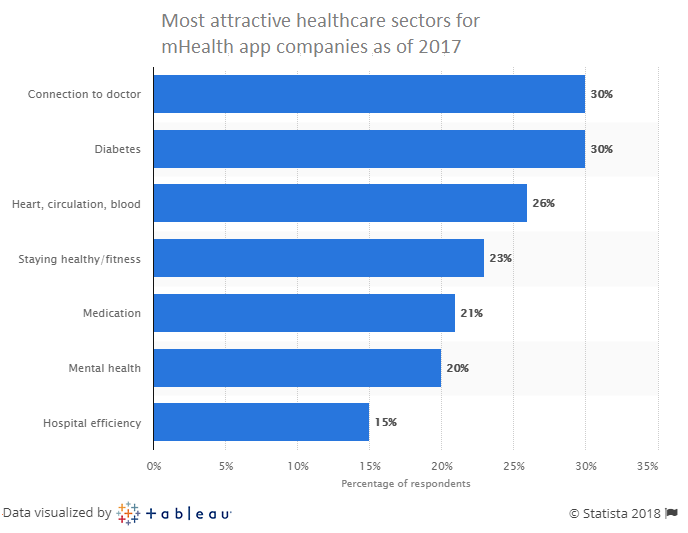 Of course, healthcare app development cannot be classed among the cheap services, but this is the very case when the game is worth the candle. Such a financial investment will pay off a hundredfold and bring an additional influx of grateful clients, satisfied with the high level of your medical services. Of course, the task of hospitals and medical institutions of any type is to treat patients, but internal organizational processes cannot be avoided anyway. And an inefficient management system often leads to a lower level of services provided. Fortunately, the problem may easily be solved by developing a hospital app. Its effectiveness is due to the fact that hospital management mobile apps allow setting clearer missions and monitoring their successful implementation really quickly. An app for a hospital is a great way to earn the reputation of a reliable modern medical company that offers its patients all the best. If you want not only to earn but also maintain a good reputation, you’ll have to make some efforts. In particular, it is necessary to regularly "work on the mistakes". A mobile health app allows you to collect patient feedback and analyze user behavior. Having gotten such information, you can see your flaws and correct them in time. Today almost every clinic has its own mobile healthcare app. So, not having one, you fail in the "competition" (and a desire to get more clients IS a competition, isn't it?). And by the way, a custom hospital app, inter alia, is a good opportunity to attract the best specialists to your clinic who would appreciate your taking care of their work comfort (see # 2). Another important reason to build hospital apps is payment system optimization. It is beneficial to all parties of the process: you (as the owner of the healthcare organization), doctors, patients. And, finally, there is another important bonus to develop a mobile app for hospitals: iPhones and other similar devices are always at hand. Thus, we're increasing the number of points of contact with patients who are also your potential customers. Who needs hospital mobile app development? Of course, there are ready-made medical apps solutions. They cannot be considered the ideal response to your individual request, but it’s useful to understand what the modern application market offers before proceeding any further. It’ll help you navigate through the hospital app development process more successfully. CareAware Connect is a great example of a mobile healthcare application to optimize hospital processes. The program allows viewing data on the status and progress of patient treatment, enables using the barcode to simplify drug management and provides other tools to improve medical efficiency. Epocrates is a mobile health service helping doctors to find medical information and calculate different patient measurements. The application is almost free, but additional functionality requires extra costs (about $159.99 a year). DSS Inc., too, belongs to hospital management mobile apps. Coordinating the functioning of hospitals, it improves the effectiveness of patient treatment and reduces administrative costs. DSS offers a variety of tools that might be useful both in an emergency situation and if someone needs home healthcare. Isabel is a diagnosis mobile app which supports both iOS and Android platforms. Its database contains more than 6,000 disease symptoms and offers a lot of useful features to get the right result. The app itself is free, but you have to pay a monthly subscription of $10.99 if you want to use its functionality properly. Marbella is a mobile health service which can be used in clinics, hospitals, and other medical institution. The mobile app allows representatives of the health system to monitor the status and condition of patients in the most convenient and simple way by using a smartphone. Of course, you should understand that if you want to achieve a perfect and profitable result, you have to build hospital apps focused on your specific requests. The service must meet your unique needs, and therefore a ready-made solution is not your best option. We hope we’ve explained to you why developing a mobile application is so important. Now let's see what features it should provide. Of course, the main functionality is being formed depending on the tasks set by the app owner but we may fantasize a little anyway. The feature allows translating the program into any language which the user finds convenient. In addition, you may work with several languages at once. A hospital application is an excellent opportunity to manage patient medical records. That's why mobile health and hospital apps are in demand among both patients and doctors. The mobile health program may include academic knowledge with a list of diagnoses divided into categories. Such a feature simplifies the treatment process by allowing doctors to save time and effort. The feature allows much more efficient planning of the treatment and examination process, as well as drawing up, approving, and correct medical protocols. Again, this will help in increasing the efficiency of doctors. Of course, medical apps must allow storing all test results, and this is another advantage of hospital app development. Adjusted filling of templates for patient examinations will help to optimize the work of all your specialists and get rid of paper documentation. If you develop a mobile app which supports such a feature, you’ll be able to attach pictures and any files to the patient history. Such a feature (a template to fill various medical forms) is another way to simplify the process of interaction between the doctor and the patient. Developing a hospital app with this feature would allow patients to avoid waiting in line. At any time, even at night, the user can take advantage of the online booking system. You can both implement the system of mass notifications (say, informing your users about the news of the clinic), and set up sending of individual messages (a reminder of the appointment with a doctor and so on). Due to online chat, the patient has a chance to contact the representatives of hospitals and medical institutions at any time and ask an urgent question online. A mobile health service which supports this feature can call a patient on behalf of your organization to voice any important information you want to communicate. Among other things, healthcare app development should be able to simplify the payment process by connecting discount cards. Want to know how to integrate payment gateway in Android and iOS applications? Read our article! For all services, you can configure the calculation feature to automate the supplies write-off process. Among other things, a custom hospital app should support automatic and manual write-off of drugs. In addition, this mobile technology would tell you for how long medicine reserves lasts. Definitely, data of the sort will greatly optimize the system of purchases and storage. analyze the patient leaving statistics because, in addition to good reasons to leave (I've been cured! ), there are many other options (an unqualified doctor, overcharge prices, etc). Acting such a way, you’ll avoid the outflow of patients. In other words, medical apps with this feature implemented will help you attract new patients and keep the old ones, as well as monitor the effectiveness of each hospital department. The feature implements the possibility of a one-touch call on the hotline of the medical center (EK for home visits or sick calls). It is also useful to provide mobile health and hospital apps with a feature that lists the full range of your medical services and gives you the opportunity to learn more about each one. Successful health apps necessarily allow their audience to leave feedback on the work of the institution, such as the level of services provided or the competence of a particular specialist. Such comments are sometimes unpleasant, but they help to adjust your strategy in time. Of course, it is impossible to imagine a mobile health service without a detailed description of the doctors, including their working hours, experience, skills, and regalia, as well as the opportunity to see free time to book an appointment. We advise you also to provide mobile health and hospital apps with illustrations: medical center photos, images of the equipment used, pics of certificates, awards, licenses, etc. The feature allows to not only learning the exact address of the medical center but also plotting the route in the hospital app itself. A health app may also be supplemented with the report feature showing which of the patients have not fully paid for the services rendered, or to whom of the supply contractors you still owe a debt. Along with other modern mobile health features, don’t forget this one: the possibility to manage all financial flows of your clinic and observe how funds are being spent. Statistical data allows getting all the information on patients, services, and doctors given the time period of interest (in the form of visual reports). Thanks to this feature, each of your marketing decisions will be taken into account and analyzed by the criterion of effectiveness. Naturally, your mobile program may include any additional features, if required. After compiling a list of the hospital mobile app features, you should determine what budget to prepare to implement them. As you understand, the process of creating hospital apps for doctors and patients is a complex and multi-stage one, and therefore it is difficult to name the universal price you’ll have to pay. But don’t worry, we’re going to provide you with detailed guidance on the matter anyway, so you’ll get an idea of the approximate hospital mobile app development cost. We’ve given you an extensive list of possible application features. It's clear that developing a mobile app which supports all of them would be a costly task. So we suggest that you think about creating the MVP model which includes minimal functionality. In the future, you can gradually expand it with additional features. Such an approach to hospital app development is not only economical but also provides an opportunity to delight users with app updates from time to time. remote record to the doctor with a few clicks. promotions / discounts / news. a list of specialists including a detailed description of doctors, their skills, and regalia. the image gallery. Photos of a medical center, its equipment, certificates, etc. The implementation of these hospital mobile app features requires much less time and, therefore, financial investments. In addition, if desired, even the described list can be reduced. By the way, we’d also like to tell you how to create a hospital app for medical store or pharmacy. Click here and read right away! Of course, the price of hospital mobile app development mainly depends on the rate of experts hired by you. It would seem that the higher the quality of work, the more money a specialist requires... but is it really so? Pricing turns out to be a much more complicated task. Let’s figure it out and see how and where to hire a hospital mobile app development company. What determines its rate? Company Size. You're often forced to pay only for the promoted name and reputation of the company. And, of course, the bigger the agency, the higher its monetary requests. Medium-sized agencies. You need to have from $200,000 to $500,000. Big mobile development companies. These experts will ask more than $500,000. Location. We think you won’t be surprised that developers in America are taking more money for their work than those who are located in Eastern Europe. This is explained by the simple fact that the standard of living in the US is much higher than, let’s say, in Poland or Ukraine. However, it doesn’t affect the quality of healthcare app development. Quality of services. The quality also plays a role in the pricing process, but it is not as important as one would expect. We advise you to hire a medium-sized company with a location in Ukraine. This is the most optimal option which combines good quality and reasonable prices. Of course, don’t forget to evaluate the portfolio of potential experts to develop a mobile app for your hospital. Make sure the company you are hiring has experience in creating applications and can meet all your needs. Thematic advertising. If you manage to make a popular and successful mobile app for the hospital, you’ll be able to invite external advertisers. Thematic ads (such as drug advertising) can either appear when the app is being launched or be permanently present on the display (in specially designated places that don’t irritate the user). Lite and Pro versions. In this case, it's quite simple: you provide a free lite version of the medical app and offer a subscription - a good option if the user wants to get access to advanced functionality. You need to find really reasoned arguments to convince a user that additional features would make his treatment process easier. In-app purchases. You can also sell new features from the app directly. That is, a client uses your mobile service without payment but he is allowed to make in-app purchases if he wants. Again, you should be very persuasive. How to start developing hospital apps? create a service which helps to solve the problem you’ve set. It's really important! In the process of healthcare app development, you need to build on the user's problem, not your own wishes (such a false step is easy to make). And these problems are not always obvious at first sight. However, experienced hospital app developers will recommend you the right approach to the issue. Imagine you have a laboratory. Your clients are people who want to take tests. And this process requires a definite preparation, right? So you should give detailed recommendations. The next step is meant to provide a user with the possibility to read the results and understand their essence: print, share with the doctor in one click, save in history. In addition, it'll be important to see a graph of the change in test results. After thinking over the working scheme of your mobile program, you can compile a list of modern mobile health features which your service must have, and then start searching for the developer. Now you are ready to explain to him what exactly you expect to get as a result. Discussion + Agreement. As a rule, at this stage, developers are striking up an acquaintance with the client: all details of the hospital mobile app development are being discussed, a technical specification is being drawn up, a contract is being concluded. Design / interfaces / structure / navigation. Now it's time to create an appealing and easy-to-use UI/UX design including the app structure and screens' interfaces. Mobile app development/testing. This is perhaps the most important stage of creating hospital apps for doctors and patients. Experts should program the app logic, connect the server and database, and conduct thorough tests. The health app launch. Now you are good and ready to publish the application in Google Play, App Store, or Web. You can supplement your mobile health program with icons and description and publish it with a clear conscience because you know: everything has been done, all the steps have been taken. As you see, the hospital mobile app development is a really complex task. Don't cherish an illusion that you'll manage on your own, this is clearly not the case when saving money is needed. We strongly recommend that you hire experienced professionals. In fact, we're willing to offer you our healthcare app development services. Agilie team employs the most qualified experts deeply interested in their work. We have extensive practical experience and would be happy to take up any challenge. Even more, we like challenging tasks! Prototyping. We develop prototypes of applications, relying on the best solutions in this field. Design. At the heart of our design are the high professionalism and the results of the latest UI / UX developments. You’ll get a unique design and beautiful and dynamic interfaces with unobtrusive smooth animation. Mobile app development. When creating applications, we apply the most advanced mobile and web technologies. Testing. The development process is accompanied by comprehensive testing, which identifies possible bugs and errors and helps to eliminate them in time. Support. If necessary, we provide technical and informational projects support. The successful and innovative mobile app for hospitals able to bring your medical center to a very new level - that's what we promise you. Contact us, and we’ll prove our words by doing.